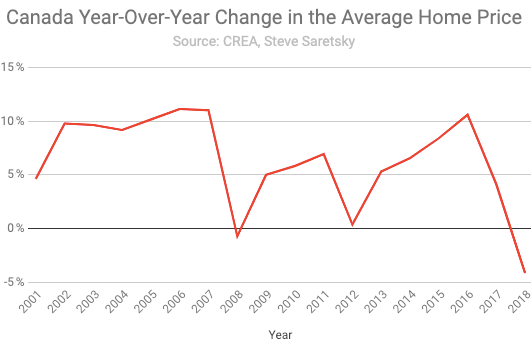 Average home price in 2018 fell for first time since 2008, largest decline in the data going back to 2001. National home sales across Canada slipped for the second consecutive year, dropping 11% when compared to 2017. It was indeed the steepest annual decline since the Financial Crisis in 2008. As a result, the average home price leaked lower to $488,699, a 4% decline from last year. The decline marked the first year-over-year drop since 2008, when the national average slipped a mere 0.71%. The bearish sentiment protruding from one of Canada’s more respected bank economists warrants further discussion as to the role of behavioral economics within financial markets. Human sentiment and narratives play a large role in the price action of financial assets, particularly for real estate. But as Shiller writes, all mania’s eventually come to an end, and the media plays an equal role in compounding the role of public sentiment in the opposite direction. Really hoping this wind of sentiment on the way down will be a category 10 hurricane rather than a calm wind. After years of insane price gain, it needs to go down opposite just as hard and if not faster. Really hoping this will also happen in SoCal market soon enough. Tired of seeing smug people in SoCal still think the market will never go down and if it does, it will only ba mild 5-10% at best…time for these people to get a rude awakening. Phonenix_Ikki – There’s no room for haters and you shouldn’t wish bad things on people. Try channeling your anger into something more positive. Excellent news and about time. Now, if we could just get rid of some of the insane nanny state zoning regulations to get more lower cost housing on the market for lower income people….. Here is an example. I live in a rural area on northern Vancouver Island. Our entire valley has been deemed a ‘flood zone’. Even though my property has not flooded for the 100 years that someone has lived here, I and many others are lumped into the same classification system. Furthermore, the side of the valley I live on is 5′ higher than the other side. The valley is bisected by a river. Someone at the Provincial level has just decreed all new construction in our area must be built upon a 12′ high foundation to avoid flooding. We have some young friends who want to build a new home here. It is doubtful now that they will. Times that by whatever number you pick and you can see how ludicrous this is. Meanwhile, all of Richmond BC is below sea level. Add in most of the Fraser Valley and we’re talking 1,000,000+ population subject to flood threat. My advice to people has always been (if possible) to move into a low bylaw and low tax rural area. Apparently, it isn’t far enough away from Victoria. My home if located in Vancouver would be unaffordable, in the millions as it is on waterfront. Here, less than $500,000. Vancouver has a long long way to fall, yet. In fact, it seems like most new property owners here are Vancouver and Victoria refugees. They sell their city homes, relocate, and retire. My experience corroborates that, but a lot of folks just don’t have the nerve to bail out of densely populated areas. Some of those who do, don’t last. Our family has been here going on 42 years, but many of us newbies have been and gone, over the years. Some simply don’t prepare realistically. The most amusing examples (to me, anyway) are some of the hippies of circa1970. The deer wouldn’t stand still to be “harvested”, the blackberries came with thorns and the local fuzz kept busting their pot patches. Worst of all, their bamboo and polyethylene abodes blew flat in the winds of November. So, they skedaddled. I live in a coastal city (Charleston) that floods if rains for more than 30 minutes, or during king tides, or whenever it feels like it since so much of it is below sea level. The beaches are constantly having to be renourished, even though I’m pretty sure Mother Nature will win that battle. Absent a federal bailout, I don’t see how the city can afford the mitigation required to keep the city afloat. Even worse, everyone down here’s been trained to believe that Climate Change is #FakeNews, eye test be damned. I’m getting the hell out as soon as I can. Which is what I don’t understand about the areas in metro Vancouver that are at or below sea level. Richmond (“the Vancouver airport”) is below sea level and is kept dry by a series of dykes and pump stations. The city’s answer? Build high rises and increase density. It can be done. About one-third of the Netherlands is below sea level. The Dutch have been world leaders in keeping the ocean waters out in below sea level lands. Flood control engineering and hydrology is not a subject for novices or something to speculate about based simply on elevation height relative to sea level. Areas that are well above sea level can be in the flood plains of the watersheds of rivers or other areas prone to flash flooding and thus be designated as in a flood zone. Climate change is real, but building any residence below sea level isn’t a climate change issue. The mistake was made long ago. You have to make sure you move far enough away from anywhere that might be built up ( the moon? ). Where we set up was several miles from a smaller town (in Europe), and it ended up like Knopfler’s Telegraph Road. It was dirt track, no electric, hardly any houses around. Then came the electricity, then the road, then all kinds of people building and all with city attitude, then came the authorities, then the law and permissions and fines – everyone out for a cut. The wildlife left and noise arrived. So with property, if it means something to you, well you find yourself in a bind, easy prey and unhappy and costly to move as well. Reminds me of a pedestrian back street behind a row of big hotels, where they joined on to what was old quarters. One house on that street was unchanged, but the rest was bars and neon and loud etc. In front of that house sat an old lady in prim traditional dress, on a wooden stool. She just sat there still and serious into the night for the hours we were there as what would have been quite unpleasant to her carried on around. Who knows, maybe it all gave her a buzz but I doubt it. So many places I know around the world have lost their character, few obviously for the better, and thats not exactly a nostalgic sort of person saying this either. ‘Several miles’ – there’s your problem. Try a hundred or two… from a small town. But in Europe you’ve crossed two/three borders by then so no hope of that type of ‘escape’. Joining the ‘Yellow Vests’ might be your best option. Love this reply! Now those same skedaddlers are sitting in a Starbucks cafe with their nose in the air wanting to be noticed! You didn’t need them anyway! I was expecting an article on this subject. Last week I was reading on HuffPo a less than flattering report. They usually try and spin as much positive as possible but one quote was: “In fact, these boom-bust markets are undergoing more of a slow and agonizing melt at the moment, and there’s little reason to believe conditions will dramatically change this year.” Bank of Montreal senior economist Robert Kavcic wrote about the prairie provinces. Makes what “sound better” recession or agonizing? I may be stupid but I don’t think that either is any more pleasing than the other unless you want to hear yourself say something! And he is a senior economist? Interesting how Canada and Australia, on opposite sides of the world, have such similar real estate cycles. The common element is their receptiveness to Chinese money. That and a mentality of digging or drilling everything up out of the ground and shipping it elsewhere to turn into something useful and far more profitable. Actually, the most profitable part of resource extraction is… resource extraction. That’s why we do it. Every additional value added production step is usually a little less profitable than the last. That’s why oil and gas extraction and basic upgrading (just enough to be transported to distant refineries) will always be more profitable than refining. That’s interesting. It’s the opposite in electronics, where the components cost little and there is a huge markup on finished products. Sorry, but I dispute your claim! Canada does not know how to be receptive to the Chinese money when it comes to investment and tourism. The leader Trudeau just made one of the biggest blunders in Canadian -Chinese commercial relations that could cost the Canadian taxpayers billions of dollars just at a time when Canadians want to diversify from the USA. Arresting a Chinese corporate leader on the say so of Donald Trump without supporting credible facts shows that Canada is a not a sovereign country but controlled by its neighbor to the south! Pierre Trudeau the father would have rolled over in his grave having seen this incident develop in the manner it has been chosen by the son. No, Australia would never have made such a blunder! The rookie needs appropriate senior leaders to advise him properly! We can’t afford to have someone learn on the job. Our tax dollars deserve more my friend! Canada and Australia have much smaller economy sizes than USA. Perhaps, each is around 10% or less of the USA’s economy. So investment money from China will have substantial effects in both Canada and Australia. Hey Canada, China’s economy is tanking, crypto is up, capital controls loosened, more laundered money coming your way. Time to break out the champagne bottles, your economy is saved! Heck, if Trudeau has his way, your population should double in the next ten year, which should keep this single leg economic miracle humming on just fine.